The Seacoast SeaPerch Regional Competition is an annual event held at the University of New Hampshire on the Durham campus, and includes different challenges for the SeaPerch teams to complete.The 2018 Challenge will take place on Friday, April 13th, in the Swasey Pool at UNH's Field House. The challenge will include an obstacle course to test the ROVs' speed and maneuverability and a poster competition. For details about the 2018 Challenge, please visit the SeaPerch National Challenge Website. More detailed information about our regional Challenge will be posted soon online and on the Seacoast SeaPerch Facebook page. Registration for our Regional SeaPerch competition will open on Friday, January 19th at 10:00 a.m. The link will be posted soon. Please note that Registration is a two-step process. Starting on January 19th, each school, group or organization can register up to 2 teams to compete in the competition during the Team Registration. Each team must consist of 2-6 students, and up to 2 coaches. At this point, any additional teams that you would like to have compete can go onto our waiting list by contacting Tara Hicks Johnson at tjohnson@ccom.unh.edu. We are limited to 50 teams, so register as soon as you can! Closer to the event, you will be given a secondary registration link and will need to provide the exact number of students competing along with their information. You do not need to know this information for the initial Team Registration. Payment will be during the Participant Registration step. Cost to compete is $15 per student (coaches are free). This includes lunch and a shirt. 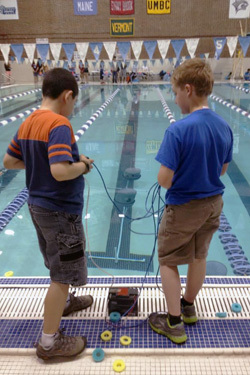 We will be following the pool challenges detailed in the National SeaPerch organization website (please see seaperch.org). At our regional competition we will be holding a POSTER competition, you will not have to provide an Engineering Notebook for grading. HOWEVER, if you place in our regional competition and go to the National Competition, they do use the Engineering Notebook, so just be aware of that and keep excellent notes! If you have any questions at all, please just message us on the Facebook page, or email Tara at tjohnson@ccom.unh.edu. VOLUNTEERS - Want to volunteer for the event? Volunteers will receive lunch and a t-shirt. Many positions are available, please check back for more information. Interested in bringing the SeaPerch ROV (Remotely Operated Vehicle) program to your classroom? Attend the next Seacoast SeaPerch Educator Workshop! Seacoast SeaPerch's one-day training program is open to educators, 4-H leaders, afterschool providers, community partners and others interested in coaching a SeaPerch club or team. Learn how to build and test an underwater ROV. Building a SeaPerch—educators will work in teams to build a SeaPerch ROV. Working with youth—learn strategies for challenging youth and incorporating the principles of inquiry science. Organizing a SeaPerch Club/Team—we will get you started in forming a SeaPerch club or team. Covering startup costs, school teams and 4-H clubs, safety, finding local sponsors, general resources and competition details. Participants will build a SeaPerch kit during the workshop in pairs, and then receive instructions and a parts list to help you build them with your group. Cost for the workshop is $25 which includes lunch and course materials. A detailed map showing parking instructions and relevant buildings will be sent before the workshop to registered participants. For more information, contact Tara Hicks Johnson by email at tjohnson@ccom.unh.edu or call 603-862-1417, and be sure to follow Seacoast SeaPerch on Facebook for updates. SeaPerch is an innovative underwater robotics program that equips teachers and students with the resources they need to build an underwater Remotely Operated Vehicle (ROV) in an in-school or out-of-school setting. 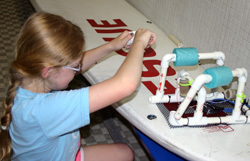 Students build the ROV from low-cost, easily accessible materials, following a curriculum that teaches basic engineering and science concepts with a marine engineering theme. The SeaPerch Program provides students with opportunity to learn about robotics, engineering, science, and mathematics while building an underwater ROV as part of a science and engineering technology curriculum. Throughout the project, students will learn engineering concepts, problem solving, teamwork, and technical applications. Students learn best by doing, and while participating in the Seacoast SeaPerch Program, they will follow steps to completely assemble the ROV, test and modify it to be sure it functions properly and then launch their vehicle to conduct various missions. SeaPerch can be readily modified to conduct specific tasks such as object retrieval and be fitted with different sensors and probes to conduct different missions. For more information and photos, visit the Seacoast SeaPerch Facebook page.